Not a whole lot of carving to report on for a couple of reasons. First, we decided to change the window coverings in the dining room to blinds. To make a long story short, that simple idea led to crown moulding, new baseboards and a fresh coat of paint on the walls. Second, I hurt my thumb. Actually, somehow I got an infection in the cuticle and boy does it hurt. 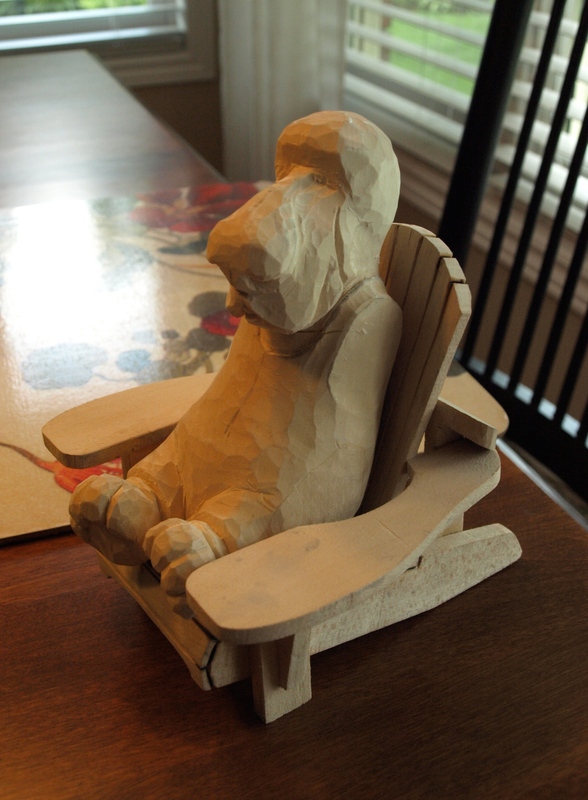 Nonetheless, I did enjoy a bit of carving today and put a bit more shape into this little basset’s paws and swimsuit. I’ll rough in the arms over the next few days as my thumb heals! Sounds like you have been very busy,but that usually happens,one idea leads to another and before you know it you have completely redecorated 🙂 your thumb sounds painful though and I hope it heals soon. On another note the little Basset is really starting to take shape,it’s looking great already and I love his little paws.